This is my kind of birthday cake! And by birthday I mean our country’s birthday as well as mine! I was born sometime between the fourth and fifth of July (I was adopted from South Korea, so time differences considered, it was probably the fourth of July here in the U.S.), and Independence Day has always been my favorite holiday. Yes, I love all things fireworks, picnics, American flags and red, white and blue. This is the berry trifle that I made for my crab feast in the beginning of June, but I think it’s the perfect dessert to kick off the holiday weekend. 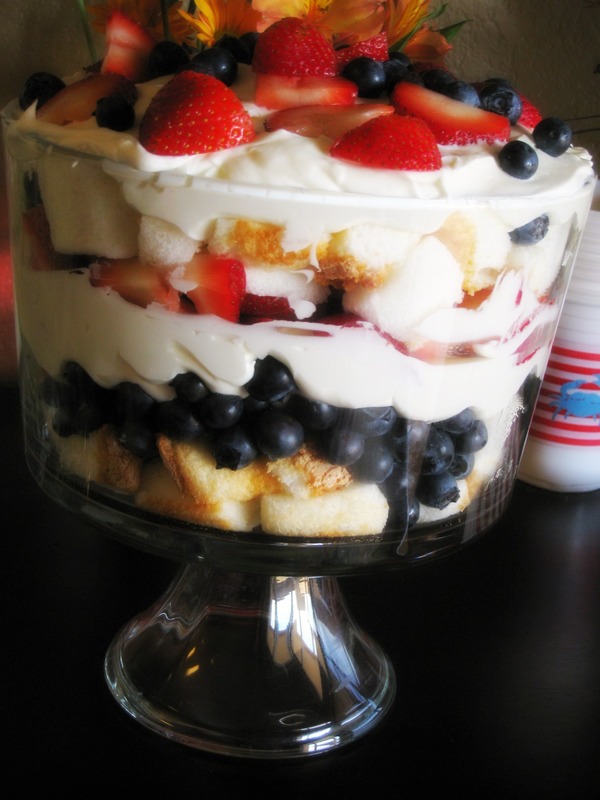 If you’re trying to find a festive dessert to serve at your Fourth of July picnic, this is it! Not only is it light, sweet and delicious, it serves a LOT of people. The recipe calls for store bought angelfood cake, but I think a homemade angelfood cake would definitely up the wow-factor with your guests. This trifle is originally from Food Network Magazine, but I used regular vanilla extract instead of the almond extract that the recipe calls for. I think it was just as good with the vanilla and I saved myself from having to buy yet another ingredient for my party. Happy Birthday America (and me, too)! Arrange half of the cake cubes in the bottom of a 13-cup trifle dish. Sprinkle evenly with a layer of blueberries. Dollop half of the cream mixture over the blueberries and gently spread. Top with a layer of strawberries. Layer the remaining cake cubes on top of the strawberries, then sprinkle with more blueberries and top with the remaining cream mixture. Finish with the remaining strawberries and blueberries, arranging them in a decorative pattern. Cover and refrigerate one hour.